When my older son Aaron with Asperger’s was young, I immersed myself in ever-evolving goals for him, including school, social skills, comprehension, extracurricular activities and his emotional development. The holiday season always presented such fun and excitement while planning for how to make our Hanukkah celebration meaningful. Our joy expanded when we had our second son Josh, who presented new complexities and made us think through how to make the holiday special for each of them. We wanted to enrich their sibling relationship and our family traditions, while honoring Aaron’s needs balanced with Josh’s. Our holiday season always culminates in a winter break trip to California to spend time with family, bringing special family time but also the challenges of travel. We started planning well ahead, sharing what to expect with special attention to how to behave going through security, often using social stories and scripts. I packed distractions and entertainment that each child could enjoy on their own or together. Before the trip, I discussed with relatives things that we were working on with Aaron and strategies we were using. Spending time with extended family gave the opportunity for Aaron or Josh to have special on-on-one time with their grandmother, aunts or uncles while bonding together with cousins. Being out of their usual surroundings and a three-hour time change presented challenges that started with falling asleep on their dinners and waking everyone in the house up at the crack of dawn upon arrival. Then came the adjustment back to their regular routine when we got home. Aaron has always been a protective, adoring, older brother. 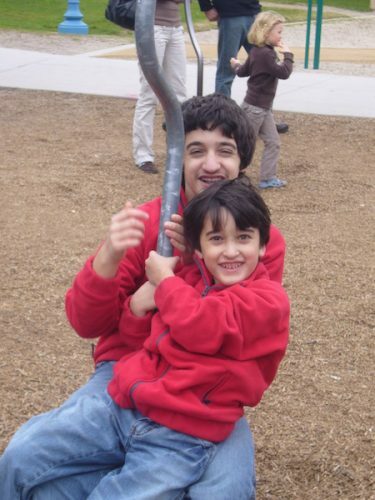 While we hovered nervously when Josh was first born worried that seven-year-old Aaron might pick up baby Josh and not realize how to handle him, Aaron was loving and careful. Aaron paid attention to the sibling workshop our Rainbow Babies & Children’s Hospital hosted for expectant families and followed their rules carefully. Children with ASD can be rule-bound and Aaron always responded beautifully to stories and scripts which the hospital used for the siblings-to-be. In fact, Aaron was so sensitive to Josh’s well-being that he was often the first to notice when rambunctious Josh would run off to explore whatever caught his eye. Aaron would run after Josh and proudly bring him back. Their close relationship grew over the years so that as Josh came to understand Aaron’s challenges and strengths, he could support him too. When Josh became very ill with Crohn’s Disease at 13 years old and was hospitalized much of the next two years, Aaron comforted Josh in a very special way. As they transition to adulthood with Aaron at 24 and Josh 17, their relationship has matured and deepened, which is the best gift of all. Giving each son the right time and support poses a delicate balance that we cannot always get just right. We do our best as parents and hope we’ve done everything we can to foster their relationship and our family bonds to offer them a strong foundation for adulthood.